Downstream 1.5 miles from Cary's Hemlock Bluffs Nature Preserve, features steep north-facing slopes rising 100 feet above the south bank of Swift Creek. Massive American beech trees form a canopy over a carpet of woodland wildflowers and ferns many of which are more commonly found in the North Carolina mountains. 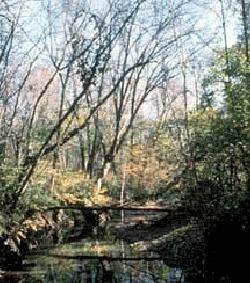 Hiking trails follow the creek, explore the bottomland and ascend the bluffs to the crest high above. From North Raleigh and points north: Take 440 Outer Beltline to Jones Franklin Road. Go south (left) on Jones Franklin Road for about 2 miles to Holly Springs Road. Turn left on Walnut Street and bear right onto Holly Springs Road at the next intersection. Proceed for 2.3 miles to the Swift Creek bridge. Swift Creek Bluffs is located just beyond Swift Creek bridge on the right side adjacent to a Town of Cary lift station. Park in the gravel lot.